MaRS interacts with thousands of entrepreneurs every year, either in an official advisory capacity with our 1,000+ venture clients or informally at the many events and meetings that we hold for the greater entrepreneurship community throughout the year. Entrepreneurs can’t bring their ideas to life in a vacuum—they need to connect with the greater community to do so. MaRS offers a central meeting place for members from all the communities in the innovation ecosystem (startup, investor, corporate and academic), a place where everyone can connect to hear about different perspectives, talk about different opportunities, attend different events and get critical feedback. Finally, entrepreneurs look for events that offer the latest in their sector, and enable them to connect with their peers. We hold events that help showcase all of the great innovation that’s happening in our three sectors (ICT, Cleantech and Health). 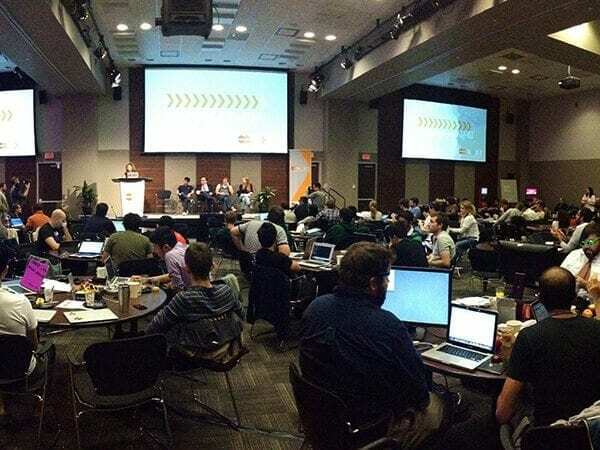 Whether it’s a grassroots event like a meetup, a technology-oriented event like a hackathon or a thought leadership event, where we bring in thought leaders from around the world to talk about disruptive trends, MaRS holds events that bring the community together and elevate the conversation about innovation.